John Stewart Bell FRS (28 June 1928 – 1 October 1990) was a Northern Irish physicist, and the originator of Bell's theorem, an important theorem in quantum physics regarding hidden variable theories. John Bell was born in Belfast, Northern Ireland. When he was 11 years old, he decided to be a scientist, and at 16 graduated from Belfast Technical High School. 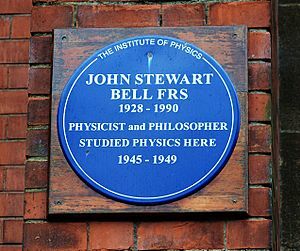 Bell then attended the Queen's University of Belfast, and obtained a bachelor's degree in experimental physics in 1948, and one in mathematical physics a year later. He went on to complete a Ph.D. in physics at the University of Birmingham in 1956, specialising in nuclear physics and quantum field theory. In 1954, he married Mary Ross, also a physicist, whom he had met while working on accelerator physics at Malvern, UK. Bell's career began with the UK Atomic Energy Research Establishment, near Harwell, Oxfordshire, known as AERE or Harwell Laboratory. After several years he moved to work for the European Organization for Nuclear Research (CERN, Conseil Européen pour la Recherche Nucléaire), in Geneva, Switzerland. There he worked almost exclusively on theoretical particle physics and on accelerator design, but found time to pursue a major avocation, investigating the foundations of quantum theory. Bell died unexpectedly of a cerebral hemorrhage in Geneva in 1990. It is widely claimed that unknown to Bell, that year he had been nominated for a Nobel Prize. . In 2008, the John Stewart Bell Prize was created by the Centre for Quantum Information and Quantum Control at the University of Toronto. The award recognizes major advances relating to the foundations of quantum mechanics and to the applications of these principles. John Stewart Bell Facts for Kids. Kiddle Encyclopedia.